It’s quite obviously a hotel. And it was designed, it happens, by the creative director of Diesel, the Italian fashion brand — a man who can pretty safely be called a designer. But don’t call it a “design hotel.” UXUA Casa’s ten villas, though newly built, are traditionally Bahian in style, far indeed from the stark, glossy spaces we expect from modern designers, and unlike some recent heavily branded fashion/hospitality crossovers, here the couture connection is purely incidental. Of course all this simply proves that modern design doesn’t have a monopoly on stylish hotels. The UXUA casas are largely handmade by local craftspeople, and they’re open to the air, with indoor/outdoor living areas and al fresco showers. The designer’s hand really only shows in the general tidiness of the look, and in a few clever touches, such as showers spouting from unexpected places. So while some boutique resorts seem geared more towards fashion shoots than hospitality, this place is all about the experience — the mosaic pool, the spa, the copious outdoor lounging space. 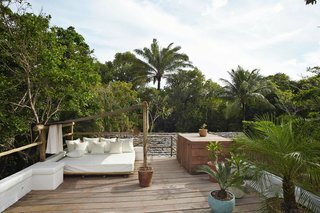 And though it feels quite private from within its gardens, and is inches from the beach, UXUA is accessibly placed just off the Trancoso town square, leaving guests with easy access to local life.